Now my heart was pumping fast and the voice of Miss USA singing “America the Beautiful” confabulated with the chill winds to bring goosebumps to my skin and a few emotional tears into my eyes. Now the stage was set up to me to play the part I had rehearsed so many times at the shores of Lake Austin, back home. 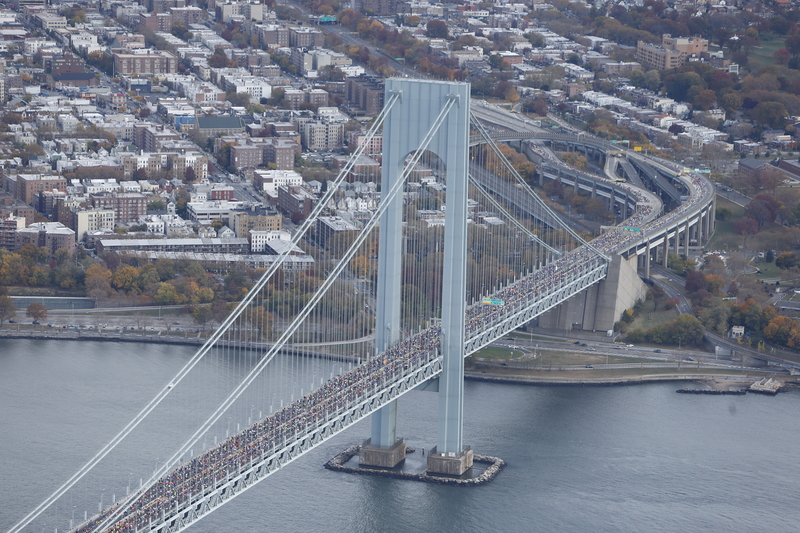 The gun went off and a sea of runners covered the Verrazano Bridge as a tide of water surging from the Hudson River. I started slower than my goal pace, for the first two miles of the course are a steep uphill onto the bridge and I wanted to save my legs for the remaining 24 miles. NYPD helicopters floated next to the bridge with the proud stance of an eagle and the swiftness of a hummingbird on the lookout for any threat to the almost 55,000 people crossing into Brooklyn. The memories of Boston and of 9-11 flashed through my mind as I took a moment to remember those affected during these tragic events. Brooklyn greeted us with a roar of cheers and excitement, which felt like an invitation to join in the surge of energy and increase my pace, but I resisted the urge to do so, knowing that disaster would happen if I caved. I anxiously awaited to get to the flatter part of the course to set my internal engine into marathon goal pace and navigate the first 13 miles of the course. To my dismay, the ups and downs of the streets of Brooklyn continued to form hills which were steeper and more numerous than I had imagined, and which continued all the way into Queens. Knowing that this was as flat as it was going to get, I set my pace to be a bit slower than my goal during the uphills and maintaining that same effort during the downhills, with the goal of having my average pace match the 8:00 per mile I had planned. The whole NYPD seemed to have been called to be on the course. I could see their distinctive octagonal shaped hats and dark uniforms lining up the streets for as far as I could see. The energy from the crowds was contagious and I felt great as I continued to make my way through the rolling hills and into the latter half of the race. My legs started to feel tired, after so many unplanned hills unaccounted for during my training, but this was my moment of truth and I could not go back in time to modify my training, so I continued to drive ahead with the hope that the multiple GU gels and constant intake of Gatorade at the water stations would be enough to keep me going strong. As we approached Manhattan and crossed the Pulaski bridge into Queens, I had to draw all the strength I had left as the horrific view of the otherwise magnificent Queensboro Bridge appeared ahead. The idea of going up the almost one mile long bridge consumed me mentally, as I visually measured the steepness of its grade as I got closer to it. I had no choice other than charge ahead, so I proceeded to run all the way up, trying to slow my pace but keep moving forward. Silence surrounded us as we made our way onto the bridge, for there is no room for crowds to line up around it. Amidst the silence, I focused on my goal and finally made it to Manhattan, where the roaring crowds seemed to celebrate the fact I had made it this far and cheered me to keep going. At this point, the law of training specifity made it clear that gentle hill long-runs during my training would not be enough to take me through the 26 miles of surprisingly challenging hills in New York at the pace I had planned for. My quads started to feel like knots being weaved by every step as my feet hit the pavement with every stride. My brain invited me to stop the pain and suffering, my legs complained loudly as I continued to run steadily. Giving up has never been an option for me, and it would not be this time either. I forced my mind to take control of my muscles and continued to follow the plan as best as I could. Cramping kept creeping onto me and my quads desperately requested a bit of sodium to be able to continue. Thankfully, as I approached the next aid station, I was able to find a few envelopes of table salt, which I mixed into my Gatorade, giving it a different taste than usual, but which tasted pretty great at that moment. At this point, my mind had taken over, since my muscles were not responding as they were supposed to. The crowd could read the pain on my face, but they could see the determination behind it and kept encouraging me at every step I took. As I crossed into the Bronx and back into Manhattan via Harlem, my body begged me to stop and I disdainfully responded by screaming “C’mon!! !” at the top of my lungs as I forced myself to visualize the finish line, which was a few miles ahead. The last five miles felt like an ancient instrument of torture being applied to my legs, but I continued to see the miles on my Garmin adding up as I got closer and closer to the magic 26.2. Finally, Central Park… yes… I could already feel the race coming to an end and pushed myself up the last few hills, the crowds cheered, I could see the photographers lined up, the mile 25 marker… it was time to play the cameras and smile, despite the shattering pain. The finish line was only 500 yards away, then 400… 300… 200…one final push… and I had done it. 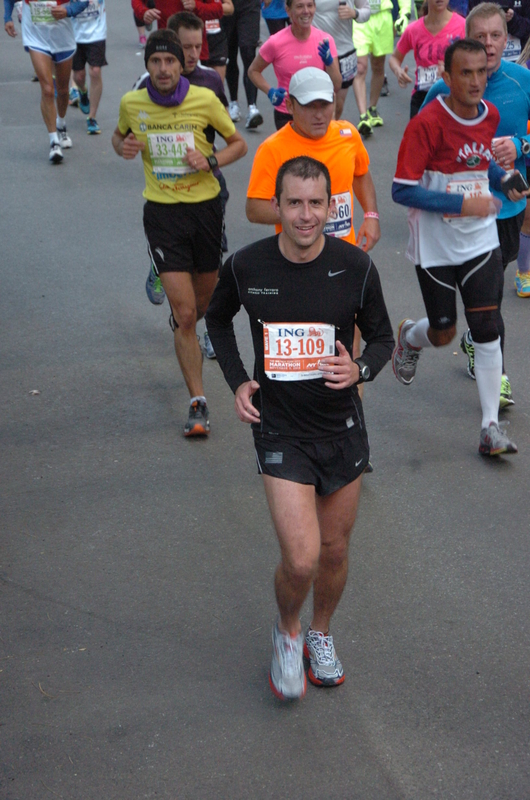 I had completed the 26.2 miles and was a New York Marathon Finisher!! I took a moment to savor victory as I crossed the blue and orange arches marking the finish line, but could not help to feel disappointment for not achieving the time I had trained for over the last twelve months. The course terrain made victory less glorious, but I vowed to challenge it to a second duel… And so, on December 2nd of this year, right after the Thanksgiving weekend, I applied to the lottery of the 2014 New York Marathon with the hopes of making it in for a second time and getting the satisfaction of conquering the terrain, and satisfying my runner ego with the finishing time I know I can achieve. New York.. it is just a matter of when… not if. This entry was posted in Uncategorized and tagged austin; anthony ferraro; new york marathon 2013; new york; marathon; rogue athletic club. Bookmark the permalink.